Mila Kunis threw Ashton Kutcher a surprise party for his 36th birthday at one of his favourite restaurants in Hollywood on Saturday night. 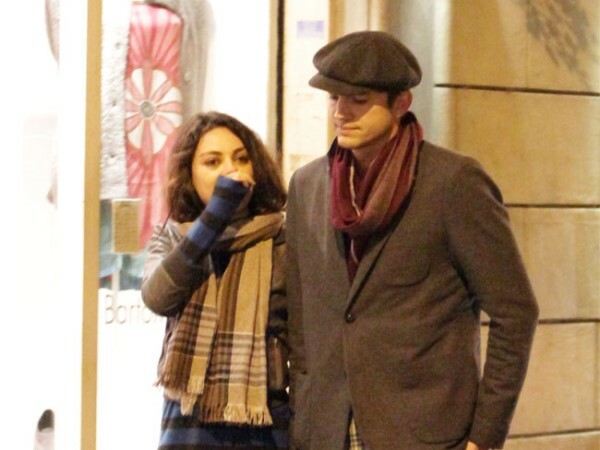 Mila Kunis threw Ashton Kutcher a surprise party for his 36th birthday. The 30-year-old actress rented out one of the Two and a Half Men star's favourite restaurants, La Poubelle, in Hollywood and invited lots of his friends to celebrate the occasion on Saturday night. A source told Us Weekly magazine: "It was very small. Ashton has been going there for year and years. It's one of his favourite spots, like home, so it was comfortable and they were well taken care of. "They had been planning it for awhile. Ashton didn't want a huge thing but they got a good group together. He's certainly changed from how he used to like to party years ago. This was more of a wholesome situation. They had a great time." The couple "looked romantic together" at the bash, as they dined on lobster, steak and quail at the French bistro. The insider added: "Mila gets along great with all of his friends. She's like part of the crew." A friend previously revealed that the couple, who first met on That 70s Show when Mila was 14 and have been dating for two years, are likely to get engaged in the near future, saying: "They talk about getting married and having kids. An engagement is imminent."